This product requires the base game Gal*Gun 2.
hope for are here right before your eyes! heard, and now, the long-awaited "Doki Doki VR Mode" is here! 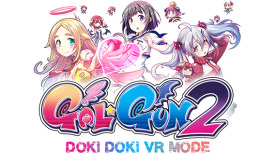 it's the complete Gal*Gun 2 experience in VR! from any distance you like, and from any angle! Get in close and you might just get a hug...or a slap in the face! You may even be able to see...well, ya know! Is your body ready to enjoy the world of Gal*Gun in virtual reality? !